-Place the water, sugar, and yeast in the bowl of a stand mixer, and allow to rest 5 minutes. -Add the remaining ingredients and knead with the dough hook until dough forms a ball. At this stage set a timer for 3 minutes, and continue kneading on low speed. -Rest the dough at warm room temperature until it’s doubled in size. The time here may vary due to your room temperature, it may take anywhere from 40 minutes to over an hour. -Once doubled removed the dough from the bowl, place the 5 cups of water over high heat and bring to a simmer, and cut the dough like a pie into 8 equal pieces. Preheat your oven to 420F. -At this stage you can roll the portions into buns or roll them out into strands and tie them in knots. If you’re forming rolls just be sure to pinch the dough together at the bottoms so they stay tightly formed. -Once the dough is portioned and shaped and the water has come to a simmer – add the baking soda to the pot (it will froth up dramatically, and then recede). -Place the rolls/knots of dough 4 at a time into the simmering soda water for no longer than 20 seconds or so, then remove them each gently one at a time, shake off excess water, and place on a prepared baking sheet. I prefer to use a silcone baking mat, as pretzel sometimes tends to stick to parchment paper. -If you have formed rolls, use a pair of scissors to snip the tops now. Sprinkle all portions with the salt, and bake in the oven until dark brown. Don’t be tempted to pull them out once they’re light golden, you want a deep brown color. Rotate at least once during baking to ensure even coloring. -Once baked cool on a wire rack until room temperature. There is a restaurant in SF that makes these and I’m obsessed! My daughter will be in heaven when I make her these. thanks for sharing this recipe. Hope they turn out great!!! My pleasure! Love it 🙂 i must try this soon!!! yum! Haha! 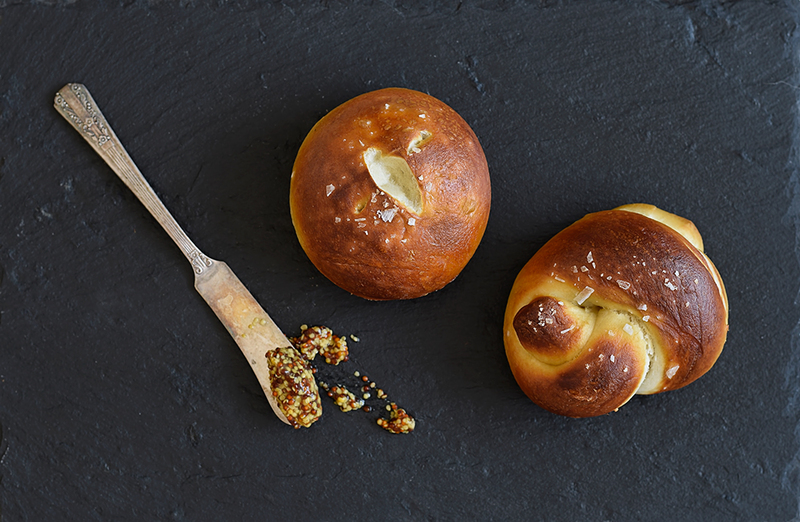 Did you get your homemade pretzels?! Sorry for such a delayed response Jenna, I’ve been absent from the WP world for a while! I haven’t gotten any in a LOOOOONG time, but I’ve got the hankering!